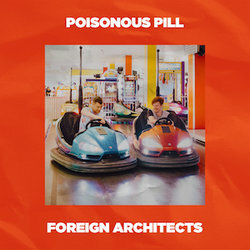 Foreign Architects’ sound can be described as a blend of indie pop with alternative leanings, however ‘Poisonous Pill’ brings a more psychedelic rock experience for fans, and displays the creative variance of the band. For this single, Foreign Architects have teamed together with producers Dylan Olivierre (The Money War, Rainy Day Women) and Andy Lawson (Eskimo Joe, Tired Lion, Morgan Bain). The single was mastered by Brian Lucey who has worked with the Arctic Monkeys, The Black Keys and Saskwatch. Songwriter Matt Burke explains that ‘Poisonous Pill’ is, “the most ‘me’ song I’ve written” and goes on to say: “This song is about closing the door on someone, being the only person left in the room, and being totally cool with that." For fans of Courtney Barnett, Tame Impala and Mac Demarco, once you press play all you need to do is sit back, relax and enjoy the jangly guitars and psychedelic rock of ‘Poisonous Pill’ available on all digital stores from Tuesday, 17 January, 2017.